Should ambassadors tweet in addition to their embassies? Last week, Molly McCluskey published an article in the Washington diplomat dealing with Swiss digital diplomacy in Washington D.C. According to the article, the new Swiss ambassador to Washington has deiced to place a greater emphasis on the embassy’s digital outreach. The article caused me to contemplate the benefits of Ambassadors tweeting on their own channel, in addition to the channel operated by their embassy. On the hand, an ambassador tweeting alongside his/her embassy might fragment the embassy’s potential audience. In addition, discrepancies might arise in the manner in which both actors portray their nation or narrate foreign policy goals. Yet there are also many benefits to having ambassadors on twitter. The ambassador is the most senior member of the embassy and the only one authorized to speak on behalf of their country. Thus, an ambassador’s account might soon attract foreign policy makers, other ambassadors, journalists and influential opinion makers. In addition, the ambassador is at times the most experienced diplomat at the embassy able to offer followers compelling analysis of world affairs as well as a “behind the scenes” look at international diplomacy. Finally, the ambassador may bring their own style and personal flare to the twitter channel thus speaking in their own voice. This may be more appealing to followers than an embassy account operated by an unknown and invisible digital diplomacy team. Iceland, PLO Delegation, Qatar, EU, Germany, France, Turkey, Norway, UK, Finland, Italy, Sweden, Israel, Switzerland. As part of the evaluation, I analyzed all tweets authored by the embassies and the ambassadors over the past two months (June and July, 2015). I did not include in the analysis re-tweets by either embassies or ambassadors. This provided with a database of 1,160 ambassador’s tweets and 2200 embassy tweets. The first parameter I evaluated was the number of tweets published by each ambassador- having an inactive ambassador on twitter is worse than having no ambassador on twitter. The graph below exhibits the number of tweets authored by each ambassador in the sample. As can be seen there seems to be a great variation in ambassador activity on twitter. Italy’s ambassador is the most active publishing more than 250 tweets over the last two months. However, France’s ambassador may be even more active. Due to technical issues, his analysis was based on only one month’s sampling and in that month alone he authored more than 170 individual tweets. Both the EU and Germany’s ambassadors are quite active while the Israeli and the PLO’s ambassador are the least active. The average ambassador authors 82 tweets a month indicating that they are quite active. 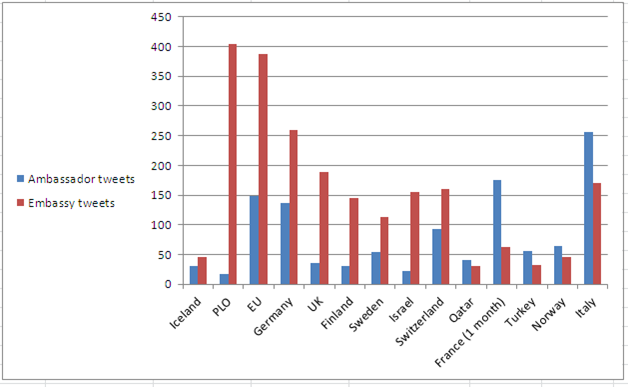 Next, I compared ambassador’s authorship of tweets to that of their embassies as can be seen in the graph below. The majority of embassies are more active than their ambassadors (including Iceland, PLO, EU, Germany, UK, Finland, Sweden, Israel and Switzerland). This in itself is not surprising as embassies to the US are likely to have designated staff member dedicated to social media activity as opposed to an ambassador who is “tweeting on the go”. What is surprising is that in some cases the gap between ambassador activity and embassy activity is rather small (Iceland and Switzerland are two examples). Finally, the most surprising finding is that some ambassadors are more active than their embassies– such is the case with Qatar, France, Turkey Norway and Italy. 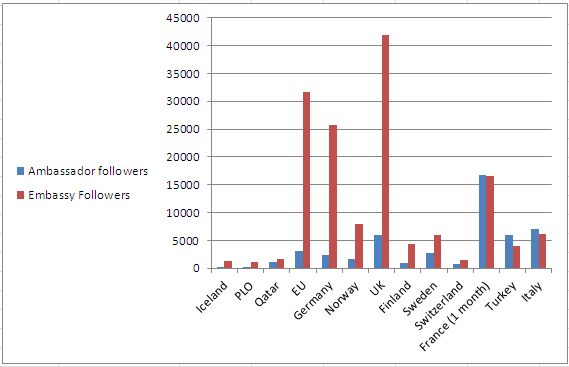 Next, I evaluated the number of followers each ambassador attracts seen in the graph below. This graph is interesting for two reasons. First, some ambassadors seem to be real tweeteraties boasting an audience of several thousands of followers. Here Israel’s ambassador leads the charge with more than 40,000 followers, followed by France’s ambassador with more than 16,000 followers and Italy’s ambassador with more than 7,000 followers. The average ambassador in this sample attracts more than 6,000 followers. This indicates that ambassadors are a potential resource for nations looking to interact with foreign populations and elites. Second, there is some correlation between an ambassador’s scope of activity and his audience base. France and Italy’s ambassadors are highly active and have large audiences while the PLO and Iceland’s ambassadors are less active and have the smallest audiences. This is another manifestation of the fact that social media activity breads interest. The outlier is of course Israel’s ambassador who is not very active but is still highly popular possibly due of Israel’s newsworthiness and its close, albeit tense, relationship with the US. 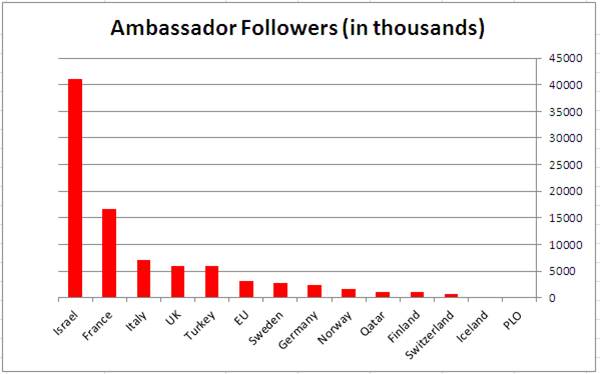 In the next stage I compared the number of followers ambassadors attract to that of their embassies as seen in the graph below. Here the trend is clearer- embassies still attract greater audiences. The average embassy in the sample attracts more than 17,000 followers while an average ambassador attracts more than 6,000. However, there are also positive examples here. The gap between embassy and ambassador followers is small in Qatar (ambassador has 1,140 and the embassy 1,500) while in France’s case the ambassador has a small gap over the embassy (16,700 as opposed to the embassy’s 16,600). Finally, both the Turkish and Italian ambassadors attract larger audiences than their embassies. The French and Italian ambassadors’ popularity may again be attributed to their high level of activity on twitter. Finally, I compared between the average number of re-tweets and favorites an ambassador’s tweet receives with the number of re-tweets and favorites of embassy tweets. These two graphs may be seen below. With regard to re-tweets, the majority of embassies have a higher average number of re-tweets than their respective ambassadors (Iceland, EU, Norway, Finland, Italy, Sweden, Switzerland). 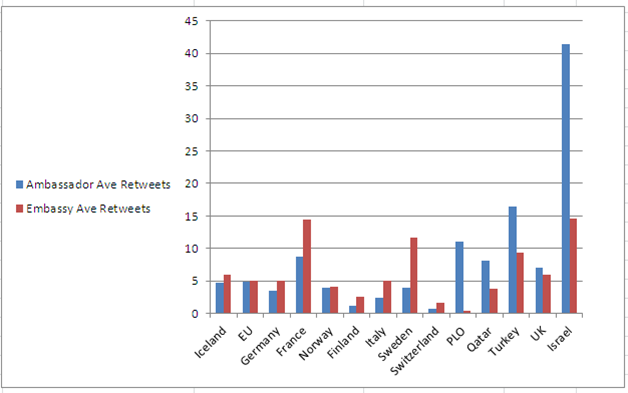 However, in many cases there is small difference in the average number of re-tweets (Iceland, EU, Norway). 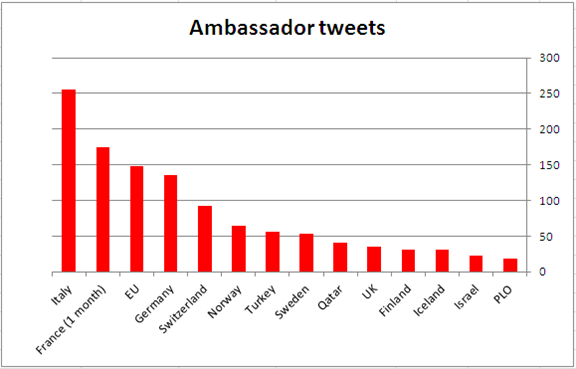 In addition, there are five ambassadors who have a higher average of re-tweets than their embassies. Interestingly, four of these five ambassadors are from the Middle East (Israel, Turkey, PLO, Qatar). With regard to favorites, a similar pattern arises. 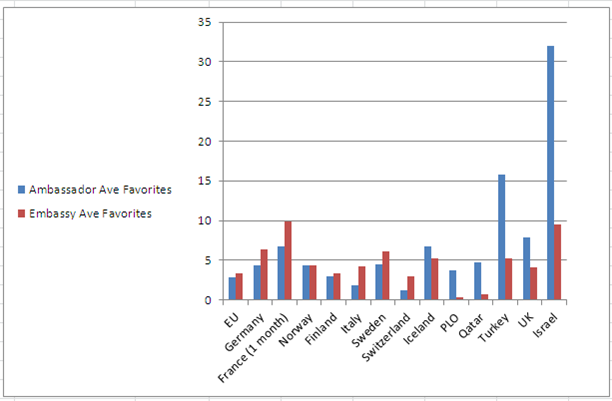 The majority of embassies have a higher average number of favorites but many times this is a small gap (EU, Norway, and Iceland). Likewise, the Israeli, British, Qatari, Turkish and Palestinian ambassadors seem to out preform their embassies in this parameter as well. The last two graphs indicate that ambassador’s content may be as engaging and interesting to audiences as that which is created by their embassies. This is truly fascinating given that in Washington, social media experts usually manage an embassy’s digital outreach while an ambassador is usually a “digital immigrant” searching for their bearings. This of course raises the question- do the ambassadors actually tweet themselves or is this account also managed by the embassy? Posted in Uncategorized and tagged ambassadors, analysis, Digital Diplomacy, embassies, Social media, twiplomacy, Twitter, US. Bookmark the permalink. ICYMI- Should ambassadors #tweet in addition to their embassy? ICYMI- Should ambassadors #tweet in addition to their embassy?